Well, we’re finally back in the groove and I am cooking again. We were away for the holidays – Southern California and Disneyland! Yeah! Oh, and family too… Kidding! No, we had a great time and we’re back on track and meal planning again. I had a plan last week but it wasn’t till the middle of the week, so I missed Monday’s post. My mind was still on vacation! 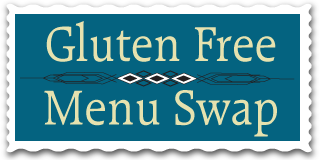 The host for this week’s Gluten Free Menu Swap is Gluten Free Goodness and the theme is soup! Who doesn’t love soup at this time of year? I know I love keeping a few of the gluten free Thai Kitchen instant “ramen” soups around this time of year, especially at work, for those chilly days when I need something to warm me up. And in fact, we had soup tonight, a tomato and chickpea soup. And with a bit of toasted boule, a delicious, warming meal. And so, on with the interesting stuff! Corn and Red Pepper Chowder with salad – chowder qualifies as soup, right? And/or maybe some of Shirley’s ‘Red Lobster’ cheese biscuits if I get ambitious (and have time)! I also need to make up some dishes for a sick friend and her family…probably a quinoa pilaf and some vegetables to go along with the Bison Roast that another friend is putting together. So, be sure to click over to Gluten Free Goodness and check out what others are making this week for a little inspiration. 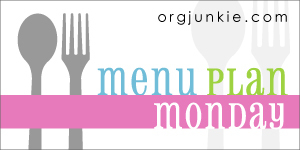 As well, check out OrgJunkie for hundreds of other ideas (not necessarily gf or veg). what fun! hope you all had a good trip and are settling back into real life. The biscuits sound yummy. Thanks Cheryl – Yes we did, it had been a few years since we had seen Grandma and all the cousins, so it was great. You were in my neck of the woods! I hope that you had a wonderful time and I’m sorry you missed the good weather – it is 80 degrees here today! I love quinoa in every way and form. Your meal plan looks divine! Hi Ameena! It was warm for us! Compared to New Mexico right now. It’s been pretty cold here but dry, luckily or not – not enough snow for my hubby, but good for me. We were there in between major rain storms so it was great. And Christmas Eve at Disney was great with a wonderful, clear blue sky! Thanks for stopping by!!! Love your blog!